For most of us, Dell is the name that we associate with desktop, laptop and server hardware. EMC is a name that we associate with enterprise storage and overall enterprise IT technology. When these two well known names got together in the largest technology merger and created a new unified entity, the entire market was abuzz. Together, they are making big strides in enterprise digital transformation and cloud adoption. Though a majority of large companies are aware that digital transformation is essential to stay competitive, only 5% are actually prepared to meet the IT requirements of the new digital business, a report by Dell EMC points out. The 1,000 participating organisations were segmented into four IT transformation maturity stages – Legacy, Emerging, Evolving and Transformed, and only 5% companies fell in the “Transformed” bucket ready to meet expectations. Of the “Transformed” companies, 85% believe their organisations are in a “very strong” or “strong” position to compete and succeed in their market over the next few years contrasted with 43% of the least mature companies. Digital Transformation: Provide customers with solutions that will secure their digital future with “a single window of engagement”. Workforce Transformation: The business transformation via new-age technologies actually happen at the grounds of workforce; wherein, the right technology is facilitated for the workforce to deliver rightly and productively. The impact to your workforce – which is changing and needs to be enabled by great technology. In fact, a recent survey said that 82% of employees say that workplace technology influences the job that they take. And soon would be launching the 2-in1 Laptop with wireless charging. In line with this and the clear direction that the world is taking towards digital transformation, the newly minted Dell EMC is setting out with clearly laid out delivery charters and resource groups to help enterprises in all aspects of their digital transformation. They are offering a spectrum of solutions and services to this effect. There are a lot of products that have been launched in this direction. Here is a look at all of them. PowerEdge 14G Servers – The highlight of Dell EMC World’s product launches will be new 14th-generation, or 14G, PowerEdge server family. The new server family is targeted at rack-scale, web-scale, converged, hyper-converged and other modern data center applications. Dell EMC also plans to pair its 14G servers to a wide swath of its storage and converged infrastructure offerings including its VxRail, VxRack and Dell EMC XC hyper-converged appliances. Cloud Flex For HCI – With Dell EMC’s new Cloud Flex for HCI, customers will be able to choose to pay for VxRail or Dell EMC XC offerings on a per-month basis over three years, with the total outlay over that time about the same as if the appliances were purchased outright. Monthly fees decrease over time, and the appliances can be returned to Dell EMC with no fee after the first 12 months. Customers can add nodes or upgrade the appliances as needed. It is slated to be available in the third quarter. VDI Complete – VDI Complete is a turnkey offering for virtual desktop infrastructure that contains all the elements necessary to implement VDI. There are three variations, including a bundle with a PowerEdge server, VMware ESX, and vCenter and Horizon that is assembled by the customer or partner; a vSAN ReadyNode-based stack; and a complete system using VxRail or Dell EMC XC. Sizing of the bundle depends on the types of client devices, such as Wyse thin clients or Dell laptops, and whether the partner or the customer will furnish the client devices. Dell EMC Cloud for Microsoft Azure Stack is a bundled offering which includes VMware cloud and Dell EMC storage technologies. Unlike the company’s Enterprise Hybrid Cloud, or EHC offering, the new Dell EMC Cloud for Microsoft Azure Stack is a turnkey platform for building a hybrid cloud offering with the same look, feel, and technology as the Microsoft Azure public cloud. It was developed in partnership with Microsoft as a way to build an Azure-based private or hybrid cloud with full encryption and data protection. Customers can add Pivotal Cloud Foundry to let developers develop Azure-based applications. VxRail 4.5 – This latest version of the VMware-based hyper-converged infrastructure appliance has been enhanced with new enterprise capabilities including automated deployment and management of multiple appliances, hardware flexibility aimed at reducing the processor core-based cost of ownership, and improved interoperability with other Dell EMC technologies by leveraging the centralized Dell EMC Secure Remote Services (ESRS) gateway. Dell EMC XC Enhancements – The Dell EMC XC Series hyper-converged appliances, which are based on Dell EMC server hardware and Nutanix software, are now available in several new versions. These include the Dell EMC XC430 Xpress, with a lower entry cost and a smaller size starting at 3U for SMB; versions bundled with Dell EMC Avamar Virtual Edition, Data Domain and Data Domain Virtual Edition; and guides to deploying Pivotal Cloud Foundry on the XC Series. New VxRack Editions – The Dell EMC VxRack rack-scale hyper-converged infrastructure offerings were given a number of upgrades including support for Dell EMC PowerEdge R930 servers for performance-demanding applications such as on-line transaction processing or in-memory data bases, as well as an option to add highly scalable next-generation Cisco Nexus 93180YC-EX switches. The company also introduced VxRack Flex, powered by its ScaleIO software-defined storage, and VxRack SDDC powered by VMware Cloud Foundation. VMAX 950F – The VMAX 950F is Dell EMC’s new all-flash enterprise storage array family flagship product. New with the VMAX 950F is a 68 percent increase in the performance as measured by IOs per second, as well as a 30 percent increase in response time. Its performance gains come from a combination of new Intel Broadwell chips, new memory support, and upgraded software that take advantage of them. Software enhancements include secure snapshot support for long-term snapshot retention, as well as enhancements for the DARE (data at rest encryption) SAN security requirements. It is scheduled to ship in June. 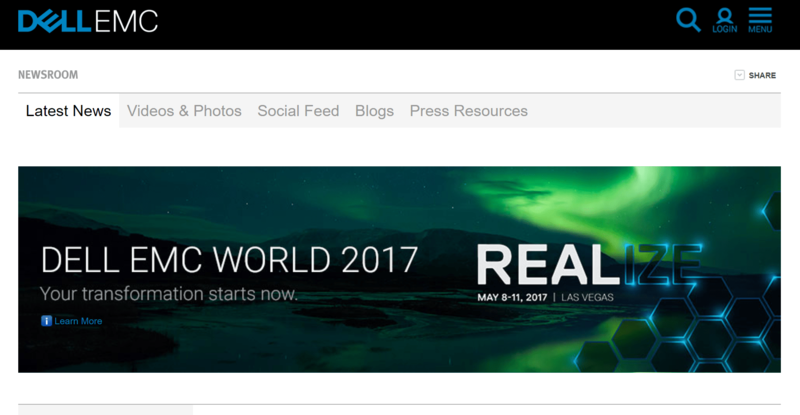 Dell EMC ScaleIO.Next – ScaleIO, Dell EMC’s enterprise-grade software-defined block storage offering, was upgraded with several enhancements at Dell EMC World. The new version, dubbed ScaleIO.Next, includes inline compression, enhanced snapshots capabilities, granular thin provisioning, and seamless volume migration in increased storage efficiency; simplified management for VMware with support for VMware Virtual Volumes (VVols); and the promise of higher performance and reduced latency when Dell EMC PowerEdge 14G servers with NVMe flash drives start shipping. ScaleIO.Next will be available as a software-only offering, an appliance based on Dell PowerEdge servers, and as part of a VxRack rack-based hyper-converged infrastructure offering. We will be watching Dell EMC closely to see where they head next in the transformational journey as a digital enterprise enabler.